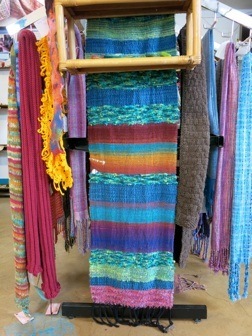 KNOTTY BY NATURE is a family run business located in Fairfield specializing in the fibre arts. Stephanie Papik and Ryan Davis (left) sell supplies and conduct courses on spinning, felting and knitting. “We are committed to the environment, family and neighbourhood,” says Davis. Knotty by Nature supports local schools and the Fairfield Community Centre, offering drop-in session for “fibre lovers” and homeschoolers. Visiting this award-winning store is a visual and sensual delight. During the Fairfield Artists Studio Tour, I found the brightly coloured interior bustled with activity. A woman sat contentedly in the corner, spinning yarn from a hand dyed braid of merino wool. She invited me to feel the silky softness of the wool. Then explained how climate affects the nature of a sheep’s fleece. to educate and connect people through textiles. as well as classes in needle felting, wet felting and drop spindling. Ryan Davis shows a customer how to complete tassels on a woven scarf. Set-up and loom rental is available. All the expertise and gadgets needed to complete a lovely scarf are close at hand. Previously located on Government Street, the new Lillian Street location is larger, allowing room for a coffee bar and ice cream treats. Weaving is an important part of Knotty by Nature’s business activity. People can quickly learn to weave on a portable loom, using Knotty’s large selection of speciality yarns. On the studio tour, I watched a class on Wet Felting a Vessel. The participants pulled brightly coloured fibres from dyed wool and placed them carefully on a wet concave ground. Watching the group pluck and tuck the delicate fibres, reminded me of nest building, a process both methodical and miraculous. and a drop spindle for spinning yarn. “The thing I love about the store is the way is connects us with local farmers, businesses and artisans of all kinds,” says Papik. A few weeks ago, a farmer in central saanich with Jacob sheep invited the couple to a shearing. This heritage breed with tri-coloured wool is rare, explains Papik, so it was exciting to be asked. to make a batt of wool for spinning. Stephanie Papik’s heritage is both Inuvialuit and Australian. She grew up in Victoria and worked for many years with the Dene Nation in the Northwest Territories. Papik currently works as Program Lead for the Aboriginal Youth Internship Program with the Public Service Agency of BC. Granted an 18 month-leave to launch the business in 2008, she has received two awards: an Eco-entrepreneur award from Women in Business and a BC Aboriginal Business Award. Saori or Zen hand-weaving is a “free” style that honours the contributions of all ages and abilities. With no measuring and counting, endless possibilities open up. The process evolves, error-free. The above sample was woven by guests on the couple’s wedding day. Weaving as a way of healing and community sharing is practiced at Knotty by Nature. A woman with autism wove the wall hanging above. “Her family has noticed the benefits,” says Ryan, “she is more communicative at home.” Ryan regularly assists a weaver with visual impairment, selecting the colours she describes. The store has a child sized loom set up to encourage youthful creativity. The couple shares two children, 14 and 12. Knotty by Nature is located at 1704 Lillian Road, Victoria. Hours of operation: Mon-Sat: 9:30-6pm, Sun 12-5pm. She has a History in Art degree and Public Relations certificate from the University of Victoria. For ten years, she operated an art & framing shop.